People started asking, where is the seventh? 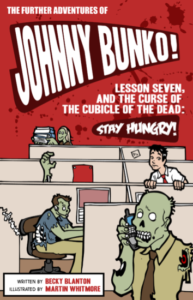 Ideas for Lesson Seven came in and the Great Johnny Bunko Challenge was born. The prize is an opportunity to join Daniel Pink on an all-expense paid trip to the TED Global Conference in Oxford, England. One of my fans is Becky Blanton. I’m one of hers, too. She has commented on this blog, and has encouraged me as a writer behind the scenes in Triiibes. Becky has entered the Johnny Bunko Challenge just as she approaches everything in life – all in, going for broke. For this challenge, she has created a website, Lesson Seven, and her idea, Staying Hungry, is a finalist. Staying Hungry is about being hungry for more, hungry for change, hungry for action. We think that persistence, which Becky has in spades, arises out of hunger. Becky has collaborated with other Triiibes members on an e-book illustrating the concept in Bunko style. As a thank you for considering her idea, you may download it here. Becky is in fine company with the two other idea finalists, “Do it now” and “Give thanks everyday.” But you won’t do anything if you’re not hungry for more. You won’t be called to action unless you’re hungry for it. And you won’t be able to give thanks for anything if you haven’t done something. Stay Hungry is the best. We’re asking you to vote for Becky’s idea. The contest closes tomorrow, January 15, 2009. If you think Staying Hungry is good career advice, send her on her way and vote here for Stay Hungry. It’s only one click for you, and a life-changer for her.